During 1981 proprietor Simon Ellis started out working for a local landscape company in Brentwood and soon realised a market existed for a business providing top quality hard and soft landscaping. In 1984, whilst living in Bentley village in Brentwood, Simon did just that, forming Bentley Landscapes in March. During the early months he worked for friends and relatives, installing crazy paving, flagstones and general landscaping and soon after, the recommendations came flooding in. Before long, it was necessary to expand and employ 3 staff and an extra vehicle. Originally invented in Holland during 1935, blockpaving made its first appearance in England in 1976 installed by Marley Paving outside Maidstone Prison, Kent. However, the first roads to be laid using this exact concept were built over 2000 years ago by the Romans. 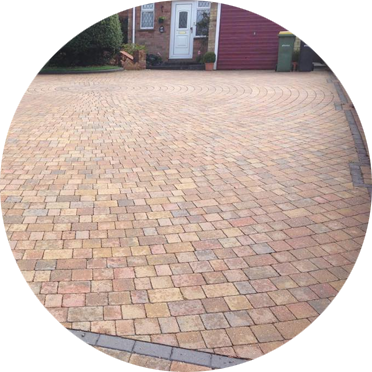 In 1985 Simon laid his first block-paving driveway in Gidea Park (driveway still there) with the help of Marley paving. Simon, impressed with the Marley concept, strength and durability realised the potential of the product. Bentley Driveways laid their first driveway in the Southend area during 1987 at Crown Hill Rayleigh (drive still there). Second and third drives were laid at High Road in Hockley (both drives still there). After those drives came another 15, followed by more and more with Bentley Driveways very quickly becoming the lead name in quality driveways and patios in the Southend area. In 1988 Bentleys set up their first working yard in Hockley and soon after that their first blockpaving display area outside Potters in Hockley, which is still there after 21 years! By 1990 Simon became aware of the number of substandard driveways being installed locally. Alan Mills owner of another local paving company and former manufacturing manager of Marley Paving had also noticed this, so together they set out to try to make the public more aware of the importance of using a competent contractor. During the coming year they set up The National Blockpaving Contractors Association (NBPCA) a national trade association that paving companies could join, providing their workmanship was up to a certain standard. Simon then spent the next 18 months travelling the whole country inspecting prospective members ability and quality of work. If good enough they were welcomed into the NBPCA and awarded a certificate and stickers for vans and stationary. In 1993 the company re-located to Rawreth Industrial Estate, Rayleigh where they built (at that time) the largest blockpaving and landscape display area in Essex. By now Bentleys were employing 25 people making them the largest paving and landscape company in the South East. In 1998, and due to the landlord selling up, they then moved to their current yard at Fairways Garden Centre. 2006 saw the addition of their own builders merchants called “The Sand Man” suppliers of sand, gravel, cement, topsoil and all types of landscaping products including natural stone, blockpaving, ornamental stone, slate and shingle. The Sand Man can be contacted on 07971 442222/443333. Trade prices for everyone! 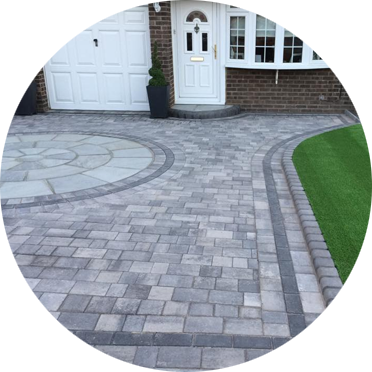 25 years later and Bentleys have built or revived over 12,500 driveways and gardens with stylish and practical solutions to suit all needs, whether commercial or within the public sector covering the entire Essex and East London area. With 10 vehicles now on the road including their own grab lorry, diggers, builders merchants and unrivaled delivery service, Bentleys are no longer reliant on any other companies during the construction of any project it gets asked to complete. Bentleys puts good relationships at the heart of its business, this also extends to the environment. Bentleys have now gone green, excavating more than 15,000 tons of rubbish each year, 90% they are proud to say is re-cycled.